The M-Part Torque Wrench is a quality tool with all the necessary attachments to correctly tighten the nuts and bolts on your bicycle. For the home mechanic, a torque wrench is a workshop essential and this complete kit has everything you need to get started. The M-Part Torque wrench is adjustable from 3-15Nm, which is a suitable range for most stems, handlebars and seat posts. It comes complete with its own storage box, to keep all the sockets neatly organised. Looked too good to be true for £33.92, and was. Due to the way the window and indicator line are set it's impossible to ensure you're looking straight at the gauge and avoiding any parallax variance. This means you can be out by +/- 1-2NM at any given setting. For a tool with a specified range of 3-15 Nm, which will likely be used at the lower end of that range, this is potentially the difference between under-torquing a part and having it work loose, or over-torquing and thereby damaging or destroying it. Either way, it entirely defeats the point of a tool like this. Spend a bit more and get a tool you can trust. Excellent little torque wrench. Almost half the price of other wrenches I was looking at. Must have for any DIY mechanic. Seems to be pretty good for the price! Only used it a couple of times so far but can't really fault it! I'm not too sure why some reviewers struggled to understand how to make sure the torque setting was accurate as it can be clearly seen on the gauge and can be checked by the dial on the base of the wrench - The dial is broken down into 0.5 increments, hence you can increment the torque using this alone e.g. one full turn is 2NM so 4NM would be 2 full turns etc. and can then be checked against the gauge. It is very clear when the torque setting has been met as the head folds, granted it is possible to tighten past this point but this can easily be avoided by not being ham fisted. Firstly its only 3-14Nm not 3-15Nm as advertised - discovered this when i went to change my rear wheel the other day :( Then there is the fact that you can be a couple of Nm out if you eye up the red line the wrong way - so if you have a carbon frame stay well clear. Finally there is no audible click and you can keep twisting the wrench without the head folding and go above the set value. Having over-tightened a few bits on a bike once, which was costly, I now view a torque wrench as an essential piece of kit. 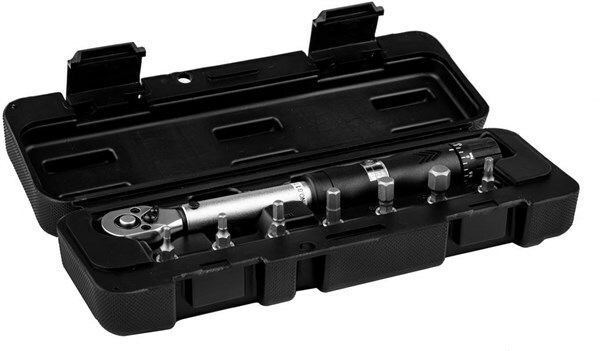 The M Part Torque Wrench does the job and is excellent quality and comes with a good range of bits. Well worth the money. Ideal for getting an idea on how tight things should be , would be better if it clicked when the torque was set rather than the head just giving , hard to tell when it's at the correct torque . Decided to purchase a Torque Wrench to save my carbon steed from any damage. after looking at a number of products this one came out on top. First class piece of kit does what it is intended to do ! !